INTERESTED IN ANOTHER BOOK STUDY? I have done a book study on this blog twice and willing to do another if I can get at least a few responses from you that you would read along with me. 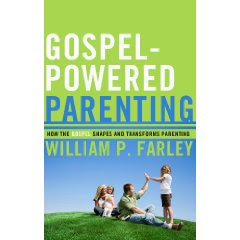 The book I am choosing is "Gospel-Powered Parenting; How the Gospel Shapes and Transforms Parenting," by William P. Farley. Pastor Farley did me a great big favor and wrote my book on parenting. As I read through the book I kept saying, "that is what I would say if I was this articulate." Here is the deal. Send me a response either in the comments to this blog or email me at george@faithbiblelincoln.org and I will let you know whether I will do this or not. Even if I don't do a read-along, do yourself a big favor and buy this book, devour it, and then live it.